As we enter the last few months of the 2016 presidential election cycle, I’ve been thinking of how I want to give this particular time the Head of State Cakes treatment. So, I’ve decided to do waffles for the spouses of this year’s presidential candidates. There’s more ground to cover with Trump’s wives, so I decided to start there. Of the three women that Donald Trump has been married to, I can’t tell you exactly why Marla Maples is the one who first piqued my curiosity. Marla Maples was Donald Trump’s second wife. They were married 1993-1997, and she is the mother of his daughter, Tiffany Trump. Maples is an actress and has starred in movies, on television and has done theater work. Marla Maples also starred on Dancing With the Stars. It was on that show where she admitted that she’s tired of getting questions about Donald Trump’s hair. Watching a few clips of Marla Maples highlights an apparent difference in personality between her and Donald Trump. Maples is very into health and wellness, and Tiffany Trump said that when she was younger that Maples would make healthy chocolates, but that Donald would sneak her down to the store in Trump Tower for Almond Joys. Maples is originally from Georgia, and has been Tiffany Trump’s primary day-to-day parent, and has tried to raise her daughter with the values that she holds dear from her own upbringing. These are the flavors that make up this Marla Maples waffle. The waffle itself is a whole wheat waffle with chopped roasted almonds in it. For sweetness there is a homemade chocolate syrup drizzled atop the waffle. 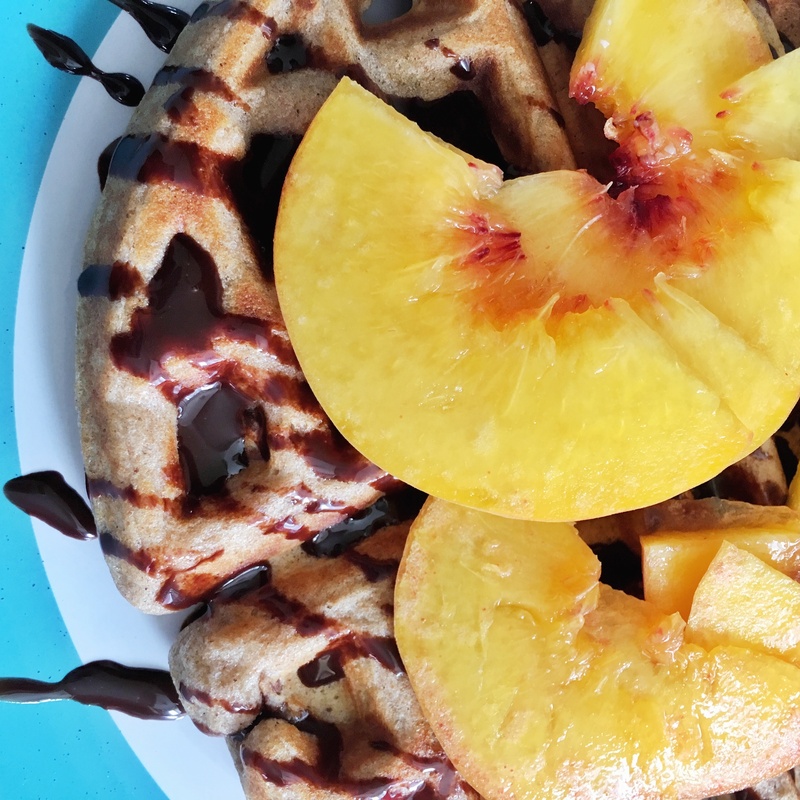 Finally, the waffle is topped with fresh sliced peaches, a nod to Maples’ Georgia roots. This entry was posted in Election 2016 and tagged Donald Trump, Marla Maples. Bookmark the permalink.